Alton Glenn Miller (March 1, 1904 – missing in action December 15, 1944) was an American big band musician, arranger, composer, and bandleader in the swing era. He was the best-selling recording artist from 1939 to 1943, leading one of the best known big bands. Miller's notable recordings include "In the Mood", "Moonlight Serenade", "Pennsylvania 6-5000", "Chattanooga Choo Choo", "A String of Pearls", "At Last", "(I've Got a Gal In) Kalamazoo", "American Patrol", "Tuxedo Junction", "Elmer's Tune", and "Little Brown Jug". During World War II, he led bands in the U.S. Army. While he was traveling in France during World War II, Glenn Miller's airplane disappeared over the English Channel. Miller was born in Clarinda, Iowa. His parents were Mattie Lou (née Cavender) and Lewis Elmer Miller. In 1915, Miller's family moved to Grant City, Missouri, and he started playing in the town orchestra. At first, he played cornet and mandolin, but he switched to trombone by 1916. In 1918, the Miller family moved to Fort Morgan, Colorado, where Miller went to high school. During his senior year, he started a band with some classmates. They played "dance band music". By the time Miller graduated from high school in 1921, he had decided to become a professional musician. In 1923, Miller entered the University of Colorado at Boulder, but he spent most of his time away from school. He played auditions and gigs. He did not do well in school. He dropped out of school, and decided to start a career as a professional musician. He later studied under Joseph Schillinger and composed "Moonlight Serenade". In 1926, Miller toured with several groups, eventually landing a good spot in Ben Pollack's group in Los Angeles. While playing with this band, Miller wrote several musical arrangements and also co-wrote his first composition, "Room 1411", with Benny Goodman. In 1928, he married Helen Burger in New York City. At first, he was the main trombone soloist of the band. But when another trombone player joined, Miller was given fewer solos. At this point, he decided he should mainly be a composer. In the late 1920s, he wrote and published a songbook. In the early 1930s, Miller was a trombonist, arranger, and composer in The Dorsey Brothers. Miller composed the songs "Annie's Cousin Fannie", "Dese Dem Dose", "Harlem Chapel Chimes", and "Tomorrow's Another Day" in 1934 and 1935. In 1935, he started an American orchestra for British bandleader Ray Noble. In this band, he featured a lead clarinet over four saxophones. He later used this arrangement in his own bands. Glenn Miller formed his first band in 1937. The band broke up after playing its last show at the Ritz Ballroom in Bridgeport, Connecticut, on January 2, 1938. Miller was discouraged and returned to New York. He realized that the band needed to have a "sound" that was different from other bands. He decided to make the clarinet and tenor saxophone play the melody together, while three other saxophones played harmony. Miller hired a saxophonist named Wilbur Schwartz, but instead had him play lead clarinet. This was unique because it did not rely on repeated motifs, like other bands. Miller had a staff who wrote and arranged songs for the band. They were Jerry Gray, Bill Finegan, Billy May, and George Williams. In September 1938, the Miller band began making recordings for Bluebird Records. Cy Shribman, a prominent East Coast businessman, began financing the band. In the spring of 1939, the band played at the Meadowbrook Ballroom in Cedar Grove, New Jersey and at the Glen Island Casino in New Rochelle, New York. At Glen Island, 1800 people attended Afterwards, the band became much more popular. The band's recording "Tuxedo Junction" sold 115,000 copies in the first week. On February 10, 1942, Miller received a gold record for "Chattanooga Choo-Choo". "Chattanooga Choo Choo" was performed by the Miller orchestra with his singers Gordon "Tex" Beneke, Paula Kelly and the vocal group, the Modernaires. Other singers with this orchestra included Marion Hutton, Skip Nelson, Ray Eberle, Kay Starr, Ernie Caceres, Dorothy Claire and Jack Lathrop. Miller and his band appeared in two films. The first one was Sun Valley Serenade (1941) The second was Orchestra Wives (1942). Bust outside the Corn Exchange in Bedford, where Miller played in World War II. In 1942, Miller decided to join the war effort because he was too old to be drafted. At first, he volunteered for the Navy but was told he was not needed. Miller then wrote to Army Brigadier General Charles Young. He asked to lead an army band so he could entertain the Allied Forces, and was accepted this time. He earned the rank of captain and he was soon promoted to major by August 1944. He was placed in the United States Army at first, but was then moved to the Army Air Forces. Captain Glenn Miller served as an officer at the training center at Maxwell Air Force Base in Montgomery, Alabama, in December 1942. He played trombone with the Rhythmaires, a 15-piece dance band, both on the base and in the town. "America means freedom and there's no expression of freedom quite so sincere as music." On December 15, 1944, Miller was to fly from the United Kingdom to Paris, France, to play for the soldiers there. His plane departed from Clapham and disappeared while flying over the English Channel. There were two other people on the plane: Lt. Col. Norman Baessell and pilot John Morgan. There have been many theories about what happened to the plane. According to a 2014 article in the Chicago Tribune, Miller's plane crashed because it had a faulty carburetor. In February 1945, Miller's wife, Helen accepted the Bronze Star Medal for him. When Glenn Miller was alive, various bandleaders like Bob Chester imitated his style. In 1942, Miller gave singer Mel Tormé advice about songwriting. By the early 1950s, more bands started to copy Miller's style. The Miller estate authorized an official Glenn Miller "ghost band" in 1946. This band was led by Tex Beneke, former tenor saxophonist and a singer for the civilian band. It was similar to the Army Air Force Band because it had a large string section. At first called the "Glenn Miller Orchestra Under the Direction of Tex Beneke", it later became "The Tex Beneke Orchestra". A film about Miller's life, The Glenn Miller Story, was released in 1953. Because of this, the Miller estate asked Ray McKinley to lead a new ghost band in 1956. This band still tours the United States. After Miller's disappearance, his Army Air Force band was decommissioned and sent back to the United States. Another band, called "the 314", took its place. Miller composed at least fourteen songs, both by himself or with other people. He added lyrics to another song. These and other songs were recorded by Miller's civilian bands and his Army Air Force band. Glenn Miller had three recordings that were put into the Grammy Hall of Fame after he died. This award is for recordings that are at least 25 years old and that have "qualitative or historical significance." ↑ The website for Arlington National Cemetery refers to Glenn Miller as "missing in action since Dec. 15, 1944" see "Major Glenn Miller", Arlington National Cemetery by Kathryn Shenkle. accessdate March 2012. ↑ Glenn Miller had 23 number one records and 72 top ten hits from 1939 to 1943; see "Song artist 6 - Glenn Miller", Tsort, accessdate March 2012, more than Elvis Presley (18 No. 1s, 38 top 10s) and The Beatles (20 No. 1s, 33 top 10s) had in their careers. See "The Glenn Miller story", GlennMillerOrchestra.se. See "Overview of Achievements", Elvis Presley Enterprises inc. accessdate September 9, 2011. ↑ 3.0 3.1 3.2 "Glenn Miller History". Glenn Miller Birthplace Society. Retrieved March 8, 2011. ↑ 4.0 4.1 Yanow, Scott. Classic Jazz. San Francisco: Backbeat, 2001. Print. ↑ "Who Is Joseph Schillinger?" at the Internet Archive, The Schillinger System. ↑ 6.0 6.1 "Glenn Miller Biography - Music Artist Band Biographies - Artists Bands Bio - Free MP3 Downloads". Music.us. Retrieved December 18, 2012. ↑ "Benny Goodman's Boys", Red Hot Jazz. ↑ Metronome, 1928, Volume 44, Page 42. ↑ 9.0 9.1 9.2 Simon (1980), pp. 65–66. ↑ Simon (1980), p. 9. ↑ George Thomas Simon, Glenn Miller and His Orchestra, New York: Crowell, 1974, ISBN 978-0-690-00470-0, p. 105. ↑ Simon, George T. (1971). Simon Says: The Sights and Sounds of the Swing Era. New York: Galahad Books. p. 491. ISBN 0-88365-001-0. ↑ "Jerry Gray", Big Band Library. Retrieved on July 29, 2011. ↑ All About Jazz. "Bill Finegan Arranger for Dorsey, Miller Bands Dies". Allaboutjazz.com. Retrieved December 18, 2012. ↑ Augustand, Melissa (February 2, 2004). "Died. Billy May, 87". Time. ↑ Simon (1980), p. 143. ↑ Twomey, Jazzsight.com. Retrieved on July 29, 2011. ↑ Schuller, Gunther (1991). The swing era: the development of jazz, 1930–1945. New York: Oxford University Press. p. 667. ISBN 0-19-507140-9. ↑ Simon (1980), p. 170. ↑ Glennmillerorchestra.com. Glennmillerorchestra.com. Retrieved on July 29, 2011. ↑ Miller, Glenn, A Legendary Performer, RCA, 1939/1991. ↑ "Band Bio", The Modernaires (October 20, 2000). Retrieved on July 29, 2011. ↑ "Marion Hutton, 67, Vocalist With Glenn Miller Orchestra". The New York Times. January 12, 1987. p. 1. Retrieved May 3, 2010. ↑ Glenn Miller » Biography, Legacy Recordings (copyright 2011). Retrieved on July 29, 2011. ↑ Kay Starr Biography, Members.tripod.com. Retrieved on July 29, 2011. ↑ Ernie Caceres, Landing.com. Retrieved on July 29, 2011. ↑ Solid! – Dorothy Claire, Parabrisas.com. Retrieved on July 29, 2011. ↑ Liner notes to RCA Vi LPT 6701, also see "Moonlight Serenade" by John Flower. (PDF). Retrieved on July 29, 2011. ↑ Sun Valley Serenade (1941), Internet Movie Database. ↑ Orchestra Wives (1942), Internet Movie Database. ↑ "Glenn Miller (1904 - 1944)". BBC News. 2002. Retrieved November 8, 2014. ↑ Simon (1980), pp. 309–310. ↑ Simon (1980), p. 324. ↑ "War Two: The Stars Wore Stripes", Ftmeade.army.mil. Retrieved on July 29, 2011. ↑ They Served Here: Thirty-Three Maxwell Men, "Glenn Miller", pp. 37–38. Benton, Jeffrey C. (1999). Air University Press. ↑ Kater, Michael (2003) . Different Drummers: Jazz in the Culture of Nazi Germany. US: Oxford University Press. p. 173. ISBN 978-0-19-516553-1. ↑ Erenberg, Lewis (1999). Swingin' the Dream: Big Band Jazz and the Rebirth of American Culture. US: University Of Chicago Press. p. 191. ISBN 978-0-226-21517-4. ↑ Simon (1980), p. 433. ↑ Solid!, Bob Chester biography/filmography, Parabrisas.com (March 20, 1908). Retrieved on July 29, 2011. ↑ Torme, Mel (1988). It Wasn't All Velvet. New York: Penguin. pp. 42–44. ISBN 0-86051-571-0. ↑ Ralph Flanagan, Bigbandlibrary.com. Retrieved on July 29, 2011. ↑ "Jerry Gray", Bigbandlibrary.com. Retrieved on July 29, 2011. ↑ Solid!, Ray Anthony biography/filmography, Parabrisas.com (January 20, 1922). Retrieved on July 29, 2011. ↑ Simon (1980), pp. 437–39. ↑ Bennett, Tony (1998). The Good Life. New York: Pocket Books. p. 312. ISBN 0-671-02469-8. ↑ Grammy Hall of Fame Database. Bennett, Tony (1998). The Good Life. New York: Pocket Books. ISBN 0-671-02469-8. Friedwald, Will (1997). The Song Is You. New York: Da Capo Press. ISBN 0-306-80742-4. Flower, John (1972). Moonlight Serenade: a bio-discography of the Glenn Miller Civilian Band. New Rochelle, NY: Arlington House. ISBN 0-87000-161-2. Miller, Glenn (1927). Glenn Miller's 125 Jazz Breaks For Trombone. Chicago: Melrose Brothers Music Company. Miller, Glenn (1939). Feist All-Star Series of Modern Rhythm Choruses Arranged By Glenn Miller For Trombone. New York: Leo J. Feist, Inc.
Simon, George Thomas (1980). Glenn Miller and His Orchestra. New York: Da Capo paperback. ISBN 0-306-80129-9. Simon, George Thomas (1971). Simon Says. New York: Galahad. ISBN 0-88365-001-0. Schuller, Gunther (1991). The Swing Era: The Development of Jazz, 1930–1945. Volume 2. New York: Oxford University Press. ISBN 0-19-507140-9. Sudhalter, Richard (1999). Lost Chords. New York: Oxford University Press. ISBN 0-19-514838-X. 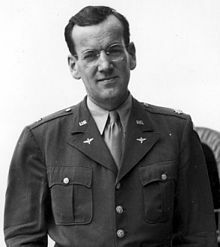 Wikimedia Commons has media related to Glenn Miller. This page was last changed on 3 July 2018, at 07:17.